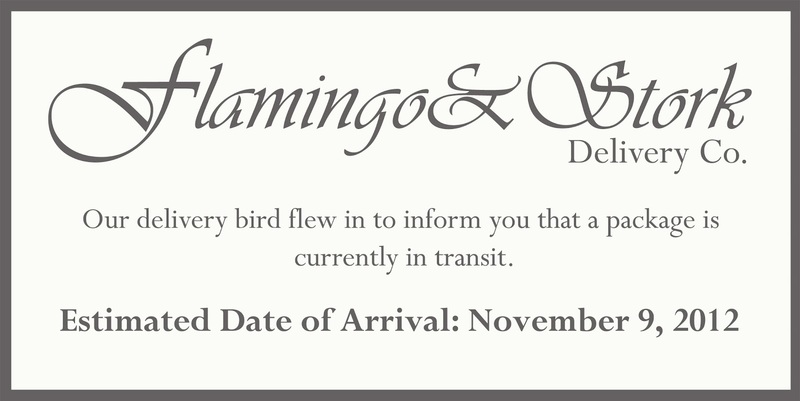 I came up with the idea to send our parents small yard flamingos (instead of storks) with a sign saying expected delivery and the estimated due date. My mom was just telling me how she got a flock to put in people’s yards for their birthdays so I figured she would get a kick out of this. My parents, however, are rarely in the same town these days…and of course none of our parents are in the same state as us…so this makes everything more difficult. We first decided to wait until after the first ultrasound to tell the parents (around 8 weeks), but I decided around 5-6 weeks would be fine. I needed someone to call and freak out to when Matt was gone and I HATED keeping secrets...especially when my dad was staying with us that month. So I had two days to get the flamingo to my parent’s house before my dad left town again. That would have cost $87 in shipping alone! I called Kristen, told her the news, she screamed "I knew it" (what? ), and I gave her the first aunt duty of buying the flamingo, printing the sign, and bringing it over. She could barely keep the secret for a day. My parents called and the first thing my dad said was, “You drank sprite at the rodeo”…I knew this whole not drinking thing would be a dead give-away. Apparently, my parents (and Kristen) had been comparing notes and just KNEW I was pregnant. Kristen brought the sign I made with the flamingo on Sunday. Thanks Auntie K (Ida)! She stuck the flamingo (with the bib she added for kicks) in their flower bed and put the rolled-up sign on their door, then knocked and hid. My mom answered and read the paper...she was pissed that someone was starting a flamingo birthday business and was a bit confused. Then she noticed that it was rolled with a hair-tie (thought that was a little unprofessional) and saw the flamingo. After she said “hello” and Kristen popped out it all hit her. Their names will be BeBe and BaBa, and my parents (mom) said DeDe and PaPa…oh boy this will get confusing. My dad said he does not want papa so I am thinking Gramps ;)…he wants Sir Kent or Lord Hubbard. Ha! Finding Out We Were "3"